Whew! That’s a pretty long blog post title you have there. But of course, I will not allow this day to end without saying a big thank you! This award is such a great honor, and I am deeply humbled by this gesture. As I mentioned, it has only been six months since I made the shift to this real passion. I would like to thank the organizers and judges of the Philippine Blog Awards for recognizing this passion and all the hard work. More power to the PBA! I’d also like to share this award with my fellow co-finalists. I have seen their blogs and I just have the greatest respect and admiration for all of them. My thanks to my Guthrie-Jensen Family for the inspiration, for listening to my stories about food! Apple Diaz, thanks for the encouragement and the words of wisdom. My friends from media — thank you for being great friends. There are so many of you, but allow me to personally thank Sherryl, Mich, JP, Francis, Nadia, Tita V, Lia, Naomi, Paolo, Vlad and Anna, Keyt, Tere, Jiggy and Marnie, Kata, and many more. My family, for being willing guinea pigs, for not minding the occasional mess in the kitchen, and for allowing me to ruin your diets once in a while. Haha! Tito Joy, thank you for the tips, stories, and all the sharings. 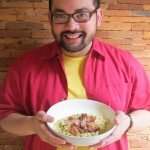 My deep thanks to all of my dear friends — the readers of RatedRalph.com from the Philippines and all around the world. Thank you for coming to the blog. Thank you for watching Comfort Zone. And most importantly, thanks for trying the recipes at home. The greatest honor people give me is when they try out the recipes for themselves. Thank you for the encouraging words you give me always. And of course, my greatest thanks to my girlfriend, my constant food trip partner, my best friend, TJ. As I would always tell you, you gave me the inspiration and extra boost to really pursue my passion. Thank you for helping me take pictures and videos. Borrowing the words of Julia Child — you are the butter to my bread and the breath to my life. I love you! Thank you very much, everyone! I look forward to cooking more in 2012! Here’s to more cooking and sharing recipes with the people we love! Thank you very much, RichieZ! Saw your blog too! And I can relate to you as a pickiest eater 🙂 God bless! Thank you very much for the heartwarming words! God bless!